C calls me lame since I hardly ever update this blog. She said it’s in deficit and laughed when I told her that I was telling a friend about it. So, in efforts to prove her wrong, and to update you guys on my process, I’ve decided to do an update. Today officially makes 13 weeks. Well, according to my ovulation date. The OB is going by LMP but hey, I’m not gonna hold that against her. LOL. It’s only a 4 day difference or so, the joys of having a short cycle! My morning sickness is definitely dwindling but the acid reflux and heartburn are beginning to be hell. Luckily, it’s only at night, so for the past couple of nights, I have fallen asleep sitting up. It’s been working so far. I actually started to get an appetite last week and the cravings have been coming like crazy. Not necessarily junk food, but I hardly eat what’s packed in my lunch box for lunch. For the past 2 days, it’s been Boston Market. Today, it was Taco Bell, and boy oh boy is this baby getting big. We went in for our NT scan this past Tuesday. Initially, we were going to opt out of genetic testing/screening but decided that since the NT test was just a simple ultrasound, why not go for it. 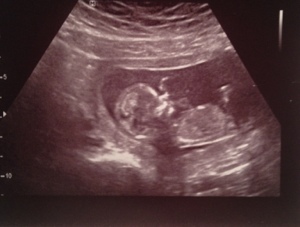 Plus, we hadn’t had an ultrasound of our little one since our first visit with the OB two weeks prior. I was more than anxious to see what this kid looked like since everything that I read said it should now look distinctly human… and, honestly, I started to panic a bit after obessively looking at the last ultrasound. I began to believe that my baby didn’t have any arms or legs and that it looked like an alien. 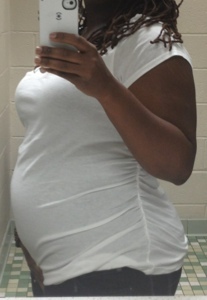 Who would’ve known how big this little person in my belly had gotten over a two week period! We settled in, bladder not as full as my previous appointment but about to burst all the same. 50 inch screen in front of us and the sonographer to my right. Immediately, this person pops up on screen and she records the heartbeat. 155 bpm. Impressive. Then, the measurements. Even with them dating me at 12 weeks 1 day, this kid was measuring WAY into 13 weeks. I’m not complaining at all… If they want to make an early debut into this here world, that is fine by me. Especially, since the Farmer’s Almanac is predicting Snowmaggedon 2013 the week we are due. We watched this little one bounce around, wave both hands, kick both feet and then, right before the doctor arrived, fall asleep! And to think, even after seeing ALL of that, it all still feels so surreal to me! My bump is rounding out quite nicely and I definitely will be shopping for more clothes sooner rather than later! Oh, I forgot to tell you that I am also off of the progesterone suppositories! We have another appointment with the OB in about 3 weeks and then hopefully, we will find out the gender soon after that. I’m so ecstatic!